Castle Hill: (1) Hartley Green Cottage and Thelcot; (2) Sloley to Rose Cottage. Hartley's one direct link with the neighbouring parish of Fawkham, Castle Hill is actually a misnomer. It was named so in the 1930s in the mistaken belief that the remains of the manor house by Fawkham Church was a castle. Either of the other contemporary names, Old Downs Hill or Steep Hill, would have been more accurate. 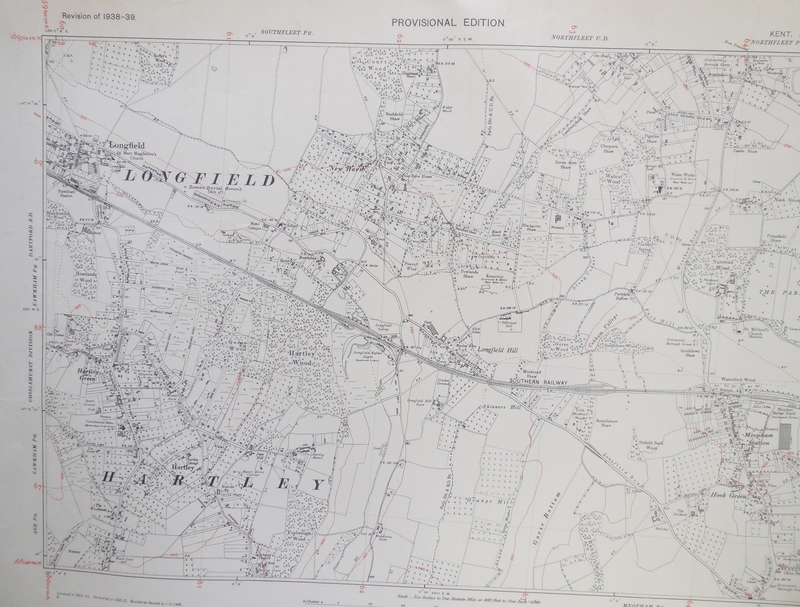 Certainly "Old Downs Hill" appears very prominently in the 1938 Ordnance Survey Map of Hartley. Castle Hill is one of Hartley's ancient roads, the earliest mention of it appears in a list of the lands owned by Fawkham Manor in 1541. It appears to have been called Hartley Lane in a deed of 1657. The border between Hartley and Fawkham lies about half way up the hill, which runs through the property Brianne (mostly in Hartley). Before the 19th century there were no houses on the road between the two thatched cottages on Hartley Green and Fawkham Church at the other end. At this time Castle Hill would have ended at the junction with Steep Hill as that road and the section of Castle Hill between the pond and Steep Hill were part of the main valley road from West Kingsdown to Longfield. For centuries the road would have been like a track to which flints and gravel were periodically added. When the road was made up In 1923 the road surface was already macadamised (flints and ragstone which were rolled in). By 1939 the road certainly had a tarred surface. A signpost to Hartley at the bottom of the hill was added in 1934. Castle Hill retains the narrow green tunnel appearance of what most of Hartley's roads must once have been like. This has meant that it is not ideal for modern traffic, especially if Hoselands Hill is blocked. in 1961 Fawkham parish proposed an improvement scheme but Hartley was more lukewarm about the scheme. In 1973 it was reported to Kent County Council as being dangerous, but all no-one seems to know the best practical solution to the problem. 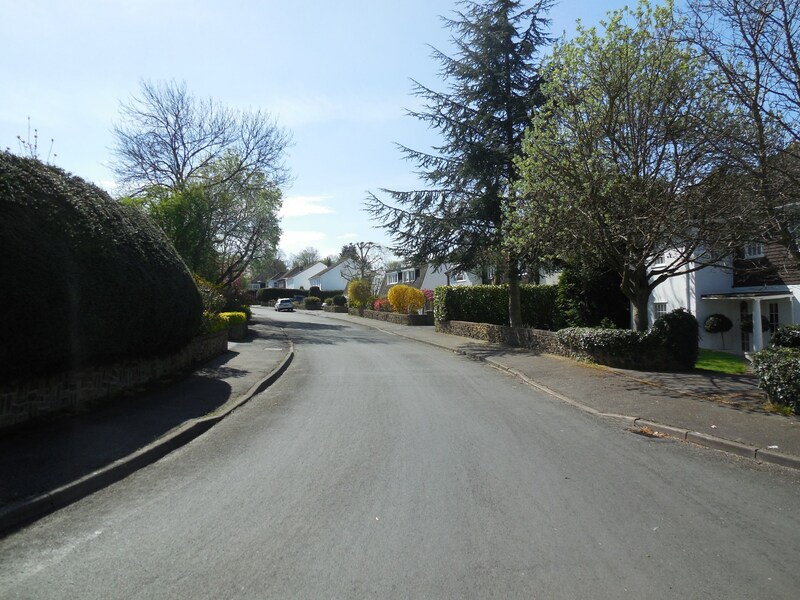 The cottages at the top of the road prevent the road being widened, and the house owners there don't like their drives being used as passing places for cars which otherwise have to back to Old Downs or Hartley Green. Presumably an exit could be constructed via Old Downs road, but that would presumably be unacceptable to those who lived there, because of the increase in traffic that would entail. The houses in Castle Hill are a mixture of ages and styles. Up until the 19th century there were no houses between Fawkham Church and Hartley Green. The first houses were the farm labourer cottages built near Hartley Green in the 1860s and 1870s. Old Downs was completed in 1887. Most of the rest of the houses belong to the 20th century, including the 8 bungalows of Sandshaw Court, Old Downs, which were constructed in 1999. In this century Valley Wood and Old Downs Gatehouse have been demolished and rebuilt. (2) Rateable value - Sevenoaks council have the rating books for 1956, 1963 and 1972. The gross rateable value is an estimate of the annual rental of the property. For some reason the 1956 rateable value was what the rent would have been in 1939. (2) Planning Permission: 1999/2612 Demolish existing bungalow and garage block erect 2 storey house and double garage, cessation of training and keeping greyhound dogs on the site.